For an inexpensive family vacation with gorgeous scenery, try reserving a spot at a State Park campground near the ocean in California. 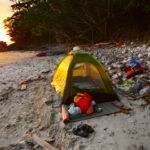 A lot of families think of camping in the woods, but beaches are also an option. There are several State Parks in California that offer oceanfront camp sites. Rather than going for a traditional hike in the forest, you can frolic in the waves and spend the afternoon building sandcastles before retiring to your tent. In Orange County, California, check out the new Moro State Park Campground. Located between Laguna Beach and Newport Beach in the Crystal Cove State Park, the campground has spectacular ocean views and miles of hiking trails that lead through the coastal brush. For only $50 to $65 a night, campers can pitch a tent or hook up their RV. The newly built 35-acre park is a bit sparse and edges the often noisy Pacific Coast Highway, but access to the beach is readily available and the picturesque sunsets are breathtaking. With the recent threat of State Park closures, this $15 million dollar project which took nearly three years is quite a feat. Check in is at 3:00 p.m. Check out is at 1:00 p.m.
For a more secluded camping experience, the park offers three hike-in campsites located on 2,400 acres of undeveloped land. The hike is a strenuous three-mile uphill climb. The campsites are located inland, but the park does include 3.2 miles of beach. Located on the beach in Crystal Cove State Park's Historic District are 14 renovated beach bungalows. The charming area also includes the oceanfront Beachcomber Cafe that is open for breakfast, lunch and dinner. The park also offers an extensive educational program that includes things like plein air painting classes and nature hikes. Other camping spots in Orange County include Regional Parks and Catalina Island. For a complete list of campgrounds in the Orange County area and to make a reservation, visit ReserveAmerica.com.